EJC calls for retribution after convicted terrorist and British MEP Martina Anderson makes the comment in European Parliament. 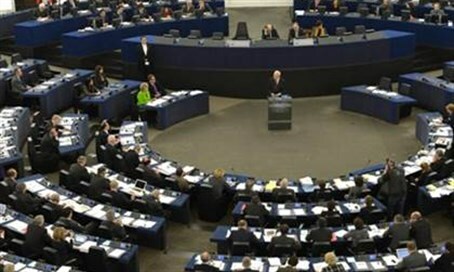 The European Jewish Congress (EJC) called on European Parliament President Martin Schulz to take action against MEP Martina Anderson on Monday, after she said Israeli lobbyists were “all over this place like a rash” during a parliament meeting last week. “Once again we hear deeply offensive statements about Jews from a European public figure and we demand action,” President Dr. Moshe Kantor stated. Anderson is a British MEP, representing Northern Ireland in the European Parliament for the Sinn Féin party, known for its anti-Israeli position. She is a former convicted terrorist with the IRA, dubbed the “beauty queen bomber," and served part of a life sentence after being convicted in taking part in a bombing of a hotel in Brighton, England in 1984 and planning mass bombing attacks on 12 English resort towns. “These views and statements should be condemned and we call on the European authorities to take a stand as strongly as if they were made by a member of the far-Right," he added.